Leading organizations in the field of Project Based Learning (PBL) have identified inquiry as a characteristic of high quality PBL, and PBL facilitators are often interested in ways to sustain student inquiry; however after reflecting on my work in the field as an educator supporting teachers I have come to feel as though this may place the cart before the horse. It is essential to first create engaging project launch experiences in order to lay the foundation for students to be able to continue to ask effective questions. 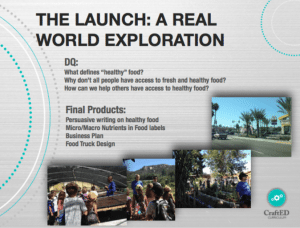 In PBL, high quality projects begin with a launch– an engaging entry experience to the project that “hooks” student engagement. This first phase of the project provides a wonderful opportunity for the Question Formulation Technique (QFT). By using the QFT in the early stages of a project we can begin to lay the building blocks of student inquiry by providing students with an engaging focus grounded in the project content. With this knowledge of the district’s commitment to QFT I tailored our PBL sessions to focus on launching and sustaining inquiry through the project launch phase using the QFT. A bedrock of high quality PBL is authenticity. One way to achieve real-world connections is through field work. Field work is different from field trips in that students are actively engaged as scientists collecting data and asking questions of what they observe and experience in the field. The newly acquired knowledge and perspective gained through field work can inform student inquiry. Therefore, field work felt like a natural entry point for marrying PBL with the QFT. This marriage can occur in the project launch phase. Students can hear from a guest speaker (in person or virtually) or visit a community location (physically or virtually) to serve as a focus to the QFT. In this way the initial field work is used as the springboard for the QFT, in other words “now that you’ve learned from your experience, let’s use that as the QFocus and ask some questions.” A best practice of field work is for students to document and then debrief their learning. The next steps of the QFT can then be used to inform students’ initial questions about the project in the next phase of the project launch. Another component of the project launch phase is the introduction to the Driving Question. In PBL the teacher zidentifies the Enduring Understanding (EU) and then develops an open-ended and developmentally appropriate Driving Question in service of the EU. This question drives all student learning throughout the project. 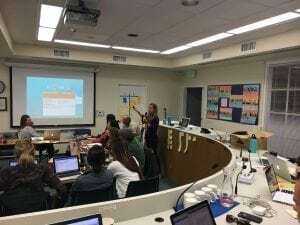 In my work with Encinitas teachers I was repeatedly asked “how do I balance my Driving Question (DQ) with all the great questions my students will ask?” I shared that after debriefing field work, the teacher then introduces the project overview and the project DQ. Because we have activated student interest through an engaging field work experience students are ripe for inquiry. Glen Warren, the Director of Literacies, Outreach and Libraries, adds “it is important to keep in mind that the a wide body of research shows that our students are not balanced in formulating their own questions. Students still tend to see themselves as ones that answer the teacher’s questions. The QFT helps bring the balance that is so needed.” Now comes the steps of the QFT process. The teacher DQ can inform the design of the QFT and the Question Focus (QFocus) so that students are building off of their experience with the field work and will formulate questions that align with the teacher DQ. These questions can be captured in the final stages of the project launch: the Know, Wanna Know and Need to Know collection. In this final phase of the project launch the teacher will ask students “what do you know already about this project,” “what do you want to learn more about,” and “what do you need to learn more about in order to complete this project?” The teacher will capture student responses in a format that allows this documentation to be a living and breathing document. This document will be dynamic because it will be revisited throughout the project. Students will develop new thinking over time, and as they revisit the document they will begin to ask new, different questions and respond differently the more they learn. The teacher uses this document to then move students into “next steps” and also refers back to the K/W/N process to inform daily workshops and project milestones; thus increasing student agency and ongoing student inquiry in the learning process. To learn more about the project launch phase of PBL check out this teacher script. To see the QFT in action watch videos of the QFT across subject areas and grade levels. Check out what field work as a focus for inquiry looks like in a 5th grade project: Food Truck Frenzy. 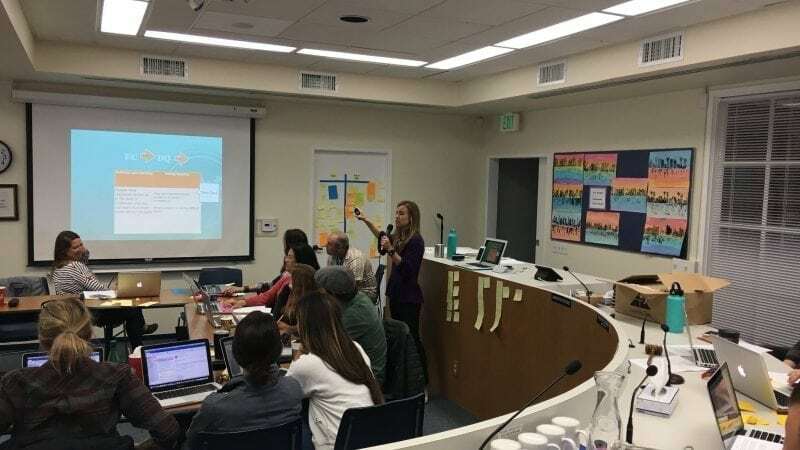 Jenny Pieratt, Ph.D. and Teacherpreneur, is President of CraftED Curriculum — a leading provider of Professional Development for PBL in Southern California. 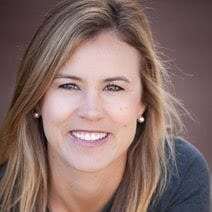 She was a founding staff member at High Tech High North County, a former School Development Coach at New Tech Network, and National Faculty at BIE. You can learn more about her work at craftedcurriculum.com and follow her work on Instagram: @Crafted_jennypieratt, Twitter: @craftEDcm, and Facebook: Crafting Deeper Learning.